What major/career would involve the study of all the things on your site? I love reading about exercise, diet, nutrition, etc. and I'm thinking of pursuing it as a career. Look for a college or university that offers a BS in Exercise Science or Kinesiology. They may go by different names but are essentially the same. A few are unique like a 5 year dual degree in Exercise and Nutrition. With appropriate training, your career paths may include personal trainer, strength and conditioning coach, athletic trainer, cardiac rehab specialist, or fitness consultant (corporate fitness, writer, sales, etc). With further schooling, you could consider physical therapy, researcher, or college instructor. Kinesiology, or Exercise Sciences encompass numerous subdisciplines including, exercise physiology, biomechanics, motorskill and development, sport and exercise psychology and sociology, and nutrition. Degrees in physical education, geriatrics, or public health are also somewhat related. I've know some physicians and physiotherapists who have obtained an exercise science degrees along with specific course work to fulfill their pre-med undergraduate degree requirement. Depending in your career path, there is also typically a certification to obtain. Stick to the nationally recognized certifications. Even with a four year degree, it's a good idea to get practical experience early on by volunteering and interning in your area(s) of interest. But before you spend the next 4 years in school, consider job shadowing or working at the local YMCA part-time to see if this is something you could do well and enjoy for years to come. You may find successful personal trainers that have have only a certification with no formal schooling in the exercise sciences. With personal training, a strong knowledge of kinesiology is not nearly as important as the trainer's personality, how well they deal with people, and their ability to sell their services and keep their clients coming back. I am currently working in a finance job, but I am seriously considering applying for a graduate degree in Kinesiology. The main problem I have is that I don't know of any resources that list all the schools with graduate programs, or which schools are best for which specialties. So far I've found a dozen or so, mostly through word of mouth. But I'm hoping to find some kind of comprehensive list- or at least to get ideas form as many people as possible! If you have any ideas you can pass along, I would really appreciate it. A web search is the best place to begin your search. You may also want to find journal articles on PubMed or the other online journals. Identify a few different specific research topics that spark your interest. Of the top researchers, take note of their past publications and what university they represent. With a little luck, this university may have an appropriate graduate program in Kinesiology or related area. In the old days, we researched these sort of things at the local library. For those that still prefer that method, I'm guessing they may still carry updated reference books with schools listed by degrees offered. Look specifically for graduate programs since most list undergraduate programs. For example, the Peterson's Guide to Four Year Colleges might have a separate guide to graduate programs (I have not confirmed this though). Another is the Guide to American Graduate Schools. There are probably other reference books, so check with the reference desks at your library. Also, most career and placement services on college campuses have these publications or resources available. 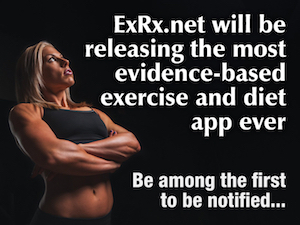 Regarding ExRx.net endorsement of Precision Nutrition Certificaition for Trainers: This is a huge issue with in my Industry, that being PT have the ability even to contemplate giving Nutrition advice. This is why professionals like myself go and study Nutrition at a high level to obtain the necessary skill set to be able to advise legally. When will it become apparent that nutrition is left to the Dieticians and Nutritionists not the Personal trainers. Thank for comments. Perhaps in an ideal world, the trainers would have degrees in all applicable disciplines (exercise sciences, nutrition, change psychology, etc.) or clients would hire a team of experts each one with specialized credentials. Good or bad, In the US, it is not only legal for trainers to counsel their clients on proper nutrition, but expected by the clients. In the US, it's only illegal to prescribe medical nutrient therapy without these higher level qualifications. Also see The Future of Personal Training. Great reply I have no issue at all with counseling clients but supplying In depth eating regimes is well beyond their scope of practice, well in Australia anyway. Once again thank you for your professional reply and any support for the client that Is safe and sustainable is a positive.